Il corso online gratuito sull’economia Circolare CircularX è arrivato alla sua seconda settimana. Il primo esercizio richiesto ai partecipanti è stato quello di dare, secondo la propria visione, una definizione di Circular Economy. Il risultato è molto interessante e, dietro richiesta, gli organizzatori del corso lo hanno messo a disposizione. Qui sotto trovate 144 diverse definizioni di economia circolare, prodotte da studenti provenienti da ogni parte del mondo. La tua qual è? 1. A circular economy breaks the linear chain of using goods with an expected lifetime and dump-date by reusing and remaking products. 2. A circular economy in my view should strive for a minimal input and output of materials and for an energy input from only sustainable sources. It mimics, so to say, a natural forest ecosystem. 3. A Circular Economy is an Economy that is conscious of the consequence of its actions and provides a system to eliminate waste. 5. Adding to all the above opinions, for me circular economy means that we are operating in an economy where it is EASY and SMOOTH for businesses/enterprises to reuse waste streams of other businesses/enterprises and that would require appropriate financial/accounting regulation and real-time information on the availability and location of the resources. 6. As humans, we tend to think linearly, because it is safe and simple. It is no surprise that from this thought process sprouts a linear economy. If we look a little deeper, most things do have a circular, cyclical nature. The cells within our bodies regenerate and recycle frequently. Our behavior, thought patterns, and very souls often follow a circular pattern. The Earth we live upon follows a circular pattern. The economy will simply follow suit. 7. 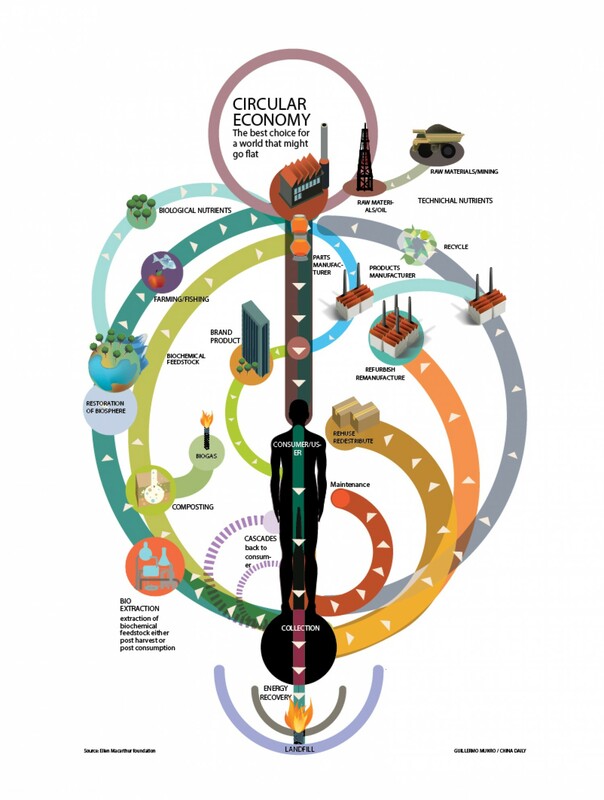 Circular economy is a mindset to solve the wicked problems from Macrocosm to Microcosm. 8. Circular economy is about maximization of products usage and minimization of waste production. 9. Circular economy is the path to keep growing and profiting in a sustainable way. Is the way to produce, use, dispose, and re-produce and re-use without harming the planet. 11. Circular Economy thinking for me is buying something when it is really necessary, but this type of thinking conflicts with the purpose of economies when you buy things you do not need or even you buy things because they are on sale. Packaging materials are used with additional purposes rather than protect the product and most of the time they are part of the disposal after purchasing a product. 12. For me, circular economy is a way to shift from our capitalistic paradigms of economic, and build a new economic system that is not being based on Growth, but on nature and his capabilities. 13. For me, within circular economy, materials/products retain their values within close-loops. 14. I define CE as closed loop supply chain combined with product-as-a-service business models. The opposite of planned obsolescence. 15. In a circular economic the circle increases its diameter but having the same center. 17. In a circular economy all goods and services are conceived and designed from the perspective that all resource use is optimised over the very long term, with obsolescence built out, durability built in, re-use planned for, closed technical loops required and with ecological and social sanity and equity at it’s heart. 18. In a circular economy companies expand their involvement at the point of sale rather than wiping their hands clean. 19. In a circular economy companies take on the responsibility of reusing and recycling, and promote to the people the concept of reusing within their own lives. Thus creating a cycle both on a large and small scale. 20. In a circular economy consuming is not about buying the most products, but getting the best product service. 22. In a circular economy everything is (re)used in such way man can live infinitely on Earth. 23. In a circular economy everything that is produced is used. 24. In a circular economy humanity is more aware of what it is using and how that relates to it’s living. 25. In a circular economy individuals and social entities might be viewed as elements of a network consisting not only of other individuals and other social entities but also of atoms and molecules, of microbes and fungi, of plants and animals, all sharing resource, producing benefits, and recycling waste. 26. In a circular economy lean production will be implemented. 27. In a circular economy man (re)uses the sources on Earth in such way man can live infinitely. 28. In a circular economy people are aware of their use of our planets resources and not wasting materials is part of our new way of thinking (designers, manufacturers as well as consumers). 31. In a circular economy products and services should be combined so that technical materials are recovered/reused/recycled at maximum and biological materials return to natural cycle. Also, in a circular economy, production and consumption patterns must be rethought to cope with these premisses (including that of a renewably fueled economy). 32. In a circular economy products have greater value to the consumer because they are designed with a purpose. Consumerism er minimized, manufacturing is more intricate and less stuff is produced. 33. In a circular economy progress is measured based on innovation and not on resource consumption. 34. In a circular economy resources are seen as valuable regardless of whether they are pre manufacture or post manufacture. In other words, product that would currently be landfilled in a linear economy is thoroughly re-analysed and it’s true value material value is calculated. A circular economy therefore puts a huge emphasis on reducing expensive and unsustainable landfill practice, reintegrating this valuable material resource back into the manufacturing cycle and so also reducing the initial raw material use in the production process. This, if done well, should be both financially and environmentally beneficial. 35. In a circular economy resources/materials are used as efficiently as possible. It needs excellent collaboration between all stakeholders: every part of the circle is aware of issues that need to be tackled in the next step(s) of the circular chain and takes those into account. 36. In a circular economy reusing reduces the contamination that’s created when raw extracted materials are used. Therefore reusing not only contaminates less it’s even more practical than any other way of producing. 37. In a circular economy service is central – ownership is not. 38. in a circular economy the consumer and the end user are in the center of the economic cycle by making and remaking act of manufacturing and comsuming. 40. In a circular economy the end and the beginning are the same. 42. In a circular economy the focus is on sustaining environmental balance through renewal of well recycled materials resulting in a rapid change in current environmental challenges, societal habits, social perspective and health. 43. In a circular economy the human necessities are satisfied optimizing the consumption of resources in order to work harmonically with the earth macro-system. 45. In a circular economy there is no need to dispose and consequently there is no waste. This should reduce the excessive use of raw materials. 46. In a circular economy there is no waste as everything is either nutrients for the biosphere or resources for the technosphere (industry). 47. In a circular economy there is no waste, there are materials for a new product, nutrients for the soil or a refurnished product. 48. In a circular economy there is no waste. 49. In a circular economy users must have the education to help the reusing and not the disposal of a product as an outcome. 51. In a circular economy we build things out of mass-produced, generic “parts”—the principle which enabled the industrial revolution. But, unlike in a linear economy, the materials in old parts can be recovered to make new parts. 52. In a circular economy we consume in a conscious and equilibrated way, thinking on the welfare of the living beings and our plantet. We do not abuse of the resources and we reduce the waste production. 53. In a circular economy we design products consisting of modules so we can easily replace these parts. 54. In a circular economy we have access to a plenty of low cost materials, that we can reuse in our homes to make our life more comfortable, and we can trade, as the begin of the economy history, to make it better. 55. In a circular economy we must strive to retain all materials in the economy with the same quality levels. 56. In a circular economy we try to create the least quantity of waste and reuse as much as possible. 59. In a circular economy you stop to externalise costs- goods and services get a fair price tag as well as the resources (both renewable and non-renewable) that they are originating from..
60. In a circular economy, “new” is not better. 61. In a circular economy, all business practices and product/service valuations are aimed at minimising resource usage, taking into account the true cost and benefit of doing business both in terms of resource usage and social impact. 62. In a circular economy, all memebers of society are conscious of the limit of resources on the planet, and thus attempt to keep these circulating within the system as long as possible. 63. In a circular economy, all the resources are managed more efficiently and waste are part of the resources. 64. In a circular economy, an effort is made to limit the use of virgin resources and the disposal of waste. Instead, the waste product from one manufacturing industry may be used as the input material (resource) for another industry and companies can work collaboratively to identify such “output-input” partnerships. 65. In a circular economy, better relationships of trust and collaboration will be built between the buyer and the seller/user. 66. In a circular economy, business works within a more environmentally sustainable model that considers reuse and re-manufacturing into the developmental design of its products. This model not only reduces waste and limits raw material extraction, it also, even if indirectly, could create a social awareness of why these qualities are important. 67. In a circular economy, businesses will be driven to recapture resources throughout each stage of the lifecycle of their products and services in order to create value for all their stakholders. 68. In a circular economy, companies design product “cradle to cradle” i/o “cradle to grave”. 69. In a circular economy, each person is responsible for its own footprint (be it environmental, social or economic) hence works towards designing a world without waste. 70. In a circular economy, especially permanent materials play a crucial role as they can be infinitely recyclable. These materials vs materials from non-renewable resources are at the heart of a circular economy model. 71. In a circular economy, everyone can be involved in protecting our natural resources for the generations to follow. 72. In a circular economy, everything is designed with the entire ecosystem in mind. There is no such thing as waste, and everything becomes energy for another form, process, or system. 73. In a circular economy, everything is sutainable because the things are re-use and re-make, That can make an economy with more value and less waste. 74. In a circular economy, everything produced cycles as a product in the economy or is returned as a natural element in nature. Nothing is wasted and thrown away. 75. In a circular economy, goods exist between companies, business to business (B2B). Individual consumers receive their products as services. 76. In a circular economy, goods o not go to waste after the are used. Recycling is practiced in other to re-use goods and products. 77. In a circular economy, have clean energy, ”reusable” energy, and recycling every material we use in our daily life. 78. In a circular economy, human activities are compatible with the functioning mode of natural ecosystems, participate to the cycling of resource throughout the biosphere and are conducive to the regeneration of natural ecosystem functions and services. 79. In a circular economy, I do not need to buy any physical things, I only rent them and buy the service. 80. In a Circular Economy, instead of we normally think, we are inside an abundance of resources, because as inside nature, nothing dies and everthing is in infinitely (re)used. 81. In a circular economy, it is essential to design products which are sustainable, one which blend in easily with the environment. 82. In a circular economy, it is normal and desirable introduce the Life-Cycle Thinking, to reduce impacts related with extraction, manufacturing and end use of materials and products. 83. In a circular economy, its about about systems thinking, not only in the same areas but multidisciplinary as well as between industries. Its about eliminating ‘waste’ and making sure no material, energy or power is overlooked. 84. In a circular economy, life mimics nature, where there is no waste and everything is endlessly recycled in a closed loop. 85. In a circular economy, maximum effort is placed on minimizing the destruction and downgrading or contamination of raw materials and components. Maintaining material quality allows for more use and more circles. 86. In a circular economy, models are drawn from a more holistic system and introduced with an economic advantage perspective. 87. In a circular economy, nothing is imported to or exported from the circle. 88. In a circular economy, people have a certain mindset to produce goods and carry out services in a creative way minimizing waste, resuing resources and repairing as much as possible. 90. In a circular economy, people should understand the territory as a system that works by having inputs and outputs that create activities and solutions that can make possible the system to be sustainable by reducing wastes and the use of raw materials. 91. In a circular economy, planned obsolescence will be a thing of the past! 92. In a circular economy, products are designed for remanufacturing and provided as services generating less waste. 93. In a circular economy, products are re-used or re-cycled without increasing the total energy consumption. 94. In a circular economy, rather to build a circular economy, we need to change our definition of waste and luxury. 96. In a circular economy, the end products are recycled or reused for other products or raw materials for these products. That is, the life cycle of a product does not end with their final disposal as waste. 97. In a circular economy, the impacts of manufacturing are thought about and considered at each step of the supply chain. A mentality of designing out negative externalities – or even removing the notion of “external” from use – is employed. Every aspect of the supply chain “belongs” and has a productive, healthy purpose. 98. In a circular economy, the minimum amount of raw material is extracted from nature. The product design development is based on maximum material and energy reuse. 99. In a Circular economy, the world society will become relatively independent of earth’s finite resources. Instead we will be able to reuse the products and materials in our economic system to further innovate, grow, expand and flourish. 100. In a Circular Economy, there is a potential for more employment. One of the features of CE ( at least in the initial phase of it) , is the modularity of products and the repair of them. Thus , there will be need for specialized technicians/designers /workers in reverse engineering and/or repairing stuff. 101. In a circular economy, there is no more rhetoric around the money ‘economy’, instead people pursue their passion with positive environmental and social impact and thoughts beyond ‘today’ and into ‘tomorrow’. 102. In a circular economy, things are reused and remade – end consumers reuse the things for the same function or different functions, suppliers remake things from used, non-functional things and innovators design things mostly out of used things, in such a creative way so that the new things can be reused multiple times or for another function with only minor changes. 103. In a circular economy, things are used again and again. So, that’s why it is important to all of the World. 104. In a circular economy, things get the value they’ve always deserved. 105. In a circular economy, to be successful it is vital that governments address the major issue of consumerism driven by the availability of low cost products (reliant on the heavy use of raw materials) in the market. 106. In a circular economy, waste from today becomes the raw material for tomorrow. 107. In a circular economy, we always find a new way to use the things and avoid the waste. Our goal is a sustainable world. 108. In a circular economy, we are inspired by how nature works. Every end of a cycle is the beggining of a new one, nothing gets wasted, everything becomes the input for a new creative, constructive process. 111. In a circular economy, we do not have ‘waste’. 112. In a circular economy, we learn from nature by adapting the ecosystems in our productdevelopment and usage. 113. In a circular economy, we only use materials that we have the technology to recycle. 114. In a circular economy, we plan and design for product reuse and recycling. 115. In a circular economy, we redefine ‘recycling’, creating products made with the intent to be recycled. Looking at the linear flow of materials that we practice globally today, we don’t create anything with recycling in mind so when we do attempt to “recycle” these materials they lose most of their qualities, essentially making this “down-cycling”. 116. In a circular economy, we reuse the materials unused from other people. 118. In a circular economy, we strive to eliminate waste by reusing all materials in the form of reusing product or parts or the materials that are in it. 120. In a circular economy, we will be able to live more sustainable lives, where our lack of waste becomes the abundance of raw materials. 122. In a circular economy, where a industry waste something, a new industry will find its raw material. 123. In a Circular Economy, you don’t need new materials any more and there is no waste. Everything will be used again. 124. In a circular economy, you upgrade but not waste. You redesign, reinvent and reuse your materials. You produce an upgraded version to what you already have. It could be reshaped or minimalised, but you’ll have a better outcome both technologically and environmentally. A sustainable design. 125. In a circular economy… people understand the fact that the things they own can come and go. What matters is the experience those things brought to them, and how they helped them get closer to their objective. 126. In a circular economy… We will enjoy a better life : BE part of an ecosystem and community, rather than HAVE things. 128. In a circular economy…the exploitation of all natural resources of the ecosystem is replaced by the concept of sensible use, where the overall balance is always observed in order to ensure there is a future habitat for all creatures. This future habitat is of no lesser comfort to anyone within that ecosystem than it is of today, i.e. realising the paramount importance of the concept of a cycle (linearity is not circularity). 129. In a circular economy: – waste becomes a ressource/input. – service rendered by a product is more important than the product itself. – (eco-)design is an important condition. 130. In a circular economy; We finding and catching something that should already worthless and causes its real value. 132. in a circular economy, it’s to make, use, and reuse for our own benefit and for the planet too! 134. In circular economy, it is essential to remake the products and reuse it as long as possible. 137. In the Circular Economy we follow the nature’s example: All the wastes are used in the process of making something new. 138. In the circular economy, waste is the inability to create value from materials. 139. research , modification of existing system and recycle and reuse make the thing economical that’s my idea. 141. the circular economy is a description of a desired balance between human use of resources and nature, facilitated through information, transparency, technology development, appropriate governance and business management (which includes design, manufacturing, distribution, use and waste treatment). 142. The circular economy is essentially a sustainable way to ensure the environment is not being harmed without compromising the advancement of the industry itself. 143. This is an interesting exercise. The circular economy can be defined in a few sentences but as you progress through the course you may wish to keep revisiting this and reflect back. 144. To design products so that the Product Life Cycle merges with the Nature’s Life Cycle maintaining the environmental balance. Il primo corso online sull’economia circolare. Gratis. Per chi è interessato ad approfondire i temi dell’economia circolare c’è una bella occasione in queste settimane. EDx, la piattaforma di corsi universitari online creata da Harvard e dal MIT di Boston, ha messo in calendario dal 20 ottobre il primo MOOC sull’economia circolare. Un MOOC è un corso online aperto a tutti e destinato a una grande platea di persone. Infatti la caratteristica di questi corsi, che offrono contenuti di alto livello, con docenti di università prestigiose, è quella di avere una comunità di studenti molto numerosa (anche decine di migliaia di persone) provenienti da tutto il mondo e con età e percorsi molto differenti. Per affrontare questo corso non sono infatti richieste competenze particolari. Il corso è organizzato dall’Università di Delft (Olanda) e dalla Ellen MacArthur Foundation, l’organizzazione che ha maggiormente contribuito alla diffusione e alla promozione dei principi dell’economia circolare. Le lezioni, che vengono frazionate in piccoli video della durata di pochi minuti,sono in inglese e sono disponibili anche le trascrizioni dei video. Al termine del corso, ovviamente, ci sarà un esame finale. La durata del corso è di 7 settimane. L’impegno stimato, per rimanere al passo con le lezioni, è di circa 3-6 ore alla settimana, ma ognuno può procedere con il suo passo o seguire solo le sessioni che lo interessano di più. I video vengono caricati ogni settimana, in modo da lasciare agli studenti il tempo di organizzare la visione quando ne hanno la possibilità. Il corso si può seguire gratuitamente. Chi lo trovasse interessante e vuole un certificato ufficiale e verificato, utilizzabile anche in un curriculum, può iscriversi ad un percorso a pagamento al termine del quale viene rilasciato un certificato personale di completamento del corso con un indirizzo univoco sul web, al costo di 50 euro. In questo caso vengono introdotti accorgimenti per verificare l’identità di chi sottopone le risposte ai test. Il programma del corso, e la possibilità di iscrivervi, li trovate qui.